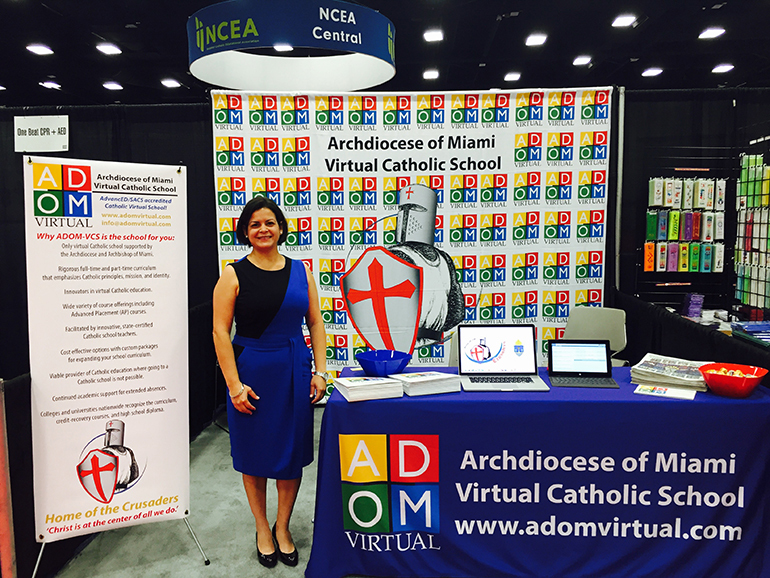 Archdiocese of Miami Virtual Catholic School Principal Rebeca Bautista represents her school at a recent National Catholic Education Association Convention and Expo. ADOM-VCS is pioneering the way as the first Catholic online school in the United States. MIAMI | The Archdiocese of Miami Virtual Catholic School will soon become the national model for online education with a Catholic identity. The proof? Principal Rebeca Bautista has been invited to participate in a panel discussion of virtual private schools at the 2018 National Private School Leadership Conference, held Sept. 20 at the Department of Education headquarters in Washington, D.C. The invitation came through Pamela Allen, education program specialist in the Office of Non-Public Education. She stopped by the ADOM-VCS booth at the National Catholic Education Association Convention and Expo in 2017 and picked up a few of their brochures. After looking through them, she decided to make virtual education a topic at this year’s private school conference — an invitation-only event that brings together 100 leaders from nonpublic schools. Via Skype, Bautista plans to bring in some other panelists. ADOM-VCS teachers Hedda Falcon, Ivette De La Vega, and Nelson Bonet, who also teach at the brick-and-mortar Msgr. Edward Pace High School in Miami Gardens. They will share their experiences teaching and interacting though Virtual School. ADOM-VCS’ fellow panelist will be HSLDA Online Academy, a Christian virtual high school based out of Northern Virginia geared toward homeschoolers. Bautista admits that she hates the word “compete” when talking about ADOM-VCS, but that’s exactly what she has to do to keep up with charter and public schools. “We always have to make sure that we’re offering the same things, if not more than the other schools,” she said. Although traditional brick-and-mortar schools have their limitations, she stressed that ADOM-VCS does not to intend to undermine them, but to enhance the range of classes available to students so that they can remain in those schools rather than leave for others that offer the courses they want. It’s also cost effective for schools that can’t afford to hire a teacher for a special class or a small number of students. They can save money by offering the course virtually. 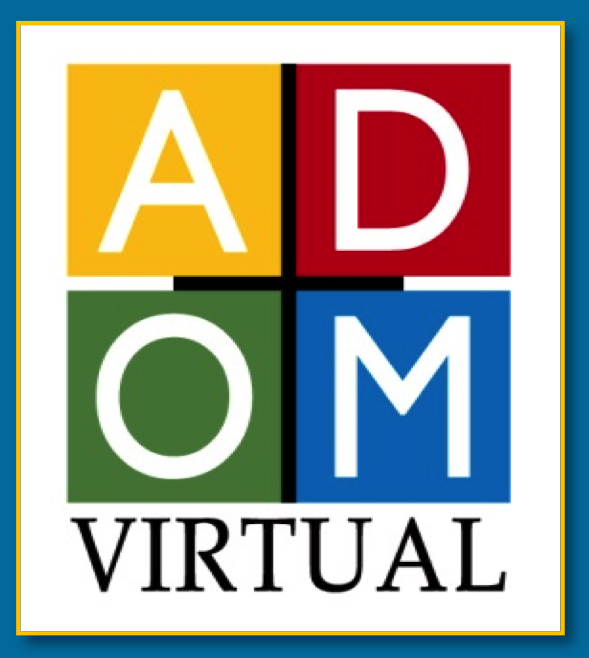 Compared to other virtual schools, ADOM-VCS does not have a minimum or maximum class capacity. ADOM-VCS started with six students. Now, between 150 and 175 per semester are enrolled. Although it accepts non-Catholic students, Bautista said nearly all come from Catholic schools. The virtual school works with 70 to 80 schools across the country. “We’re everywhere, from California on the west coast, to Delaware on the east, and everywhere in between,” said Bautista. Some students take one or two courses, while others, for a variety of reasons, are enrolled fulltime. ADOM-VCS is also the high school for the only Catholic school on the islands of Turks and Caicos, graduating between eight and 15 students a year. “Because those students want to attend, ideally, an American university or college, they want an American high school diploma,” said Bautista. When ADOM-VCS started, it only offered classes for grades nine through 12. Now it has expanded to cater to academically advanced students in middle school, who can earn high school credits through a dual enrollment program. “Once we know that it’s a good product and it’s working here locally, we can offer it to all across the nation,” said Bautista. In October, ADOM-VCS also will offer the first batch of courses for adults, open to all archdiocesan Catholic school teachers. Regardless of the subject they teach, they now need to be certified as catechists. The courses needed for that will continue to be offered in person by the Office of Catechesis, but there will now be a virtual option. “We’re not only helping Catholic students, but we are helping Catholic teachers,” said Bautista. If the program proves successful, it also will be launched nationally. Because virtual schools are so new, Bautista has to dispel misconceptions that virtual education is not as valid as the brick-and-mortar one. “People think you’re going to sit in front of a computer and click away, and the teacher is going to say, ‘Thank you,’ and give you an ‘A’,” said Bautista. She can personally vouch that it’s not that easy, having earned her master’s degree online and now working toward a doctorate. “It takes just as many hours in the virtual setting as it does in the physical setting, and it is just as rigorous. The difference is that you can do it at the leisure of the hours that you choose. But because you can work from anywhere at any time, there are no excuses for missing deadlines,” she said. Virtual school is a godsend for students who are sick or traveling due to extracurricular activities, such as sports. The flexible hours enable them not to miss out on learning. Bautista added that many places in the nation do not have a Catholic school within commuting distance. In extreme cases, like Hawaii, students have to fly to a different island. With the virtual Catholic school, all they need is an internet connection and a computer or tablet. “Catholic education now is spreading to areas where maybe we couldn’t before,” said Bautista. 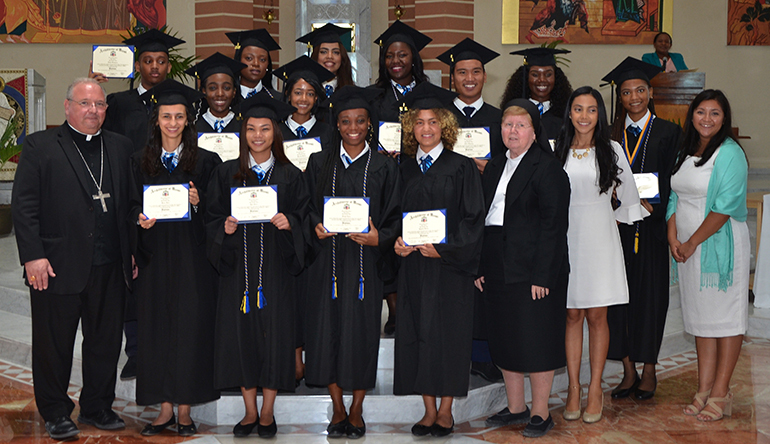 2018 graduates of Holy Family Academy and the Archdiocese of Miami Virtual Catholic School in the Turks and Caicos Islands pose for a photo with Bishop Peter Baldacchino, far left, Sister Elizabeth Worley of the Sisters of St. Joseph, archdiocesan chancellor and COO, as well as their 12th grade teacher and principal. The Turks and Caicos educational system provides education through the 11th grade. In order to qualify for U.S. universities, the students of Holy Family Academy complete their 12th grade via the ADOM Virtual School, gathering daily as a group at the academy's classrooms. It is great to see how the first virtual Catholic school in the country, Catholic Schools K12 Virtual, grew from a parish mission of St. Andrew Catholic Church, to become the ADOM-VCS. Anything that gives Catholic education an edge is to be celebrated. Congratulations!